it's been a while since i've participated in how we wore it. it's one of my favorite posts, and i'm so happy it's back. here's how it works. we get an inspiration photo and create a look inspired by the photo. i often try to copy the look as closely as possible, but that does not always work. if you are interested in signing up for next month, head over to deidre's blog. this month is one of those times where copying the look as closely as possible didn't work out. 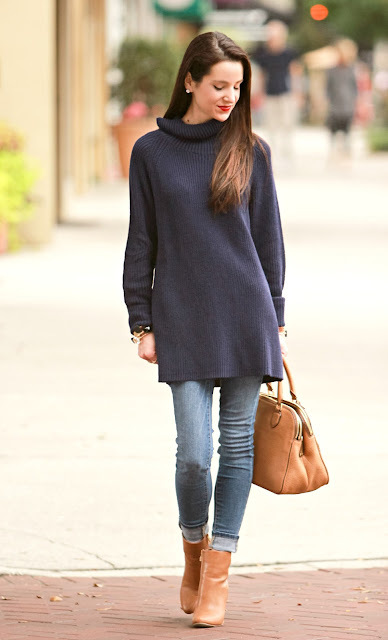 a few things stood out to me in the look-over sized sweater, navy blue, camel boots. i took those pieces to create my look. i can't wait to see how everyone else styled this look. check out their posts below. I love how you styled this look! That pencil skirt looks great on you! So fun to have you in the How We Wore it this month! I love the way you changed it up! Everything in this outfit looks so flattering on you. I love your look! It is so cute and perfect for fall! Lookin' good Aubrey! Navy blue will always be a favorite color! I love that you added a skirt to the inspiration. It's so cute! I love your take on the look! So different than anyone elses!! You look so cute! I love that you paired a skirt with the sweater and boots! Great look!